- 150 metres grading 1.22 g/t Au with a core of 50 metres grading 2.29 g/t Au (DOA-743). A drill plan showing the location of the Dorado drill holes is attached. 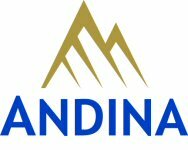 "Drilling continues to successfully delineate and expand the dimensions of the Dorado West deposit and NW Zone", stated Carl B. Hansen, President and CEO of Andina. "The corridor of gold mineralization associated with the Dorado West deposit and related NW Zone has been traced over a distance of 1.4 kilometres with widths up to 700 metres. As the Volcan gold resources continue to grow, Andina will begin to focus its attention on the technical aspects of the project with the planned commencement of an economic assessment of the Dorado deposits during the second half of this year." Four of the six Dorado West deposit drill holes were infill holes collared to define and extend the continuity of the gold mineralization. Drill hole DOA-730, collared on section 650, returned a better than anticipated 210 metres grading 0.88 g/t Au extending the continuity of gold mineralization vertically between two drill holes spaced approximately 300 metres apart. Reverse circulation drill hole ROA-739 confirmed the presence of a low-grade gold halo surrounding the Dorado West deposit returning a 112 metre interval grading 0.37 g/t Au. The drill hole ended with 48 metres grading 1.25 g/t Au possibly representing a western extension of the Central Zone deposit. Drill hole DOA-741, collared on section 1250, intersected two limbs of the Dorado West deposit. The first intercept of 176 metres grading 1.01 g/t Au extends the deposit around a barren intrusive towards the NW zone. The second intercept, 256 metres grading 1.04 g/t Au, traces the main northeast trend of the West deposit to a depth of 600 metres. Two drill holes collared into the NW Zone extension, previously cut by a single hole (DOA-711 - 206 metres grading 0.65 g/t Au), has outlined a zone of gold mineralization over a strike length of 400 metres with widths of up to 100 metres. Drill hole DOA-743, collared 300 metres west of DOA-711, returned 150 metres grading 1.22 g/t Au with a core zone of 50 metres grading 2.29 g/t Au. Hole DOA-747, collared 90 metres west of DOA-711, cut 86 metres grading 0.71 g/t Au. The east northeast trending NW Zone extension remains open along strike in both directions and to depth. No resource has previously been estimated for this area. Two drill rigs returned to the Ojo de Agua area in March to follow up on the previously announced drill results from the Andrea zone (48 metres grading 2.54 g/t Au from drill hole DODA-721) and Florencia zone (304 metres grading 0.55 g/t Au from drill hole DODA-718). Nine reverse circulation and three diamond drill holes were completed during the second half of March and through April for a total of 5,100 metres. Results are pending. On January 2, 2008, Andina announced that it had entered into an agreement to acquire water rights, at a total volume of 340 litres per second, from a Chilean company subject to completion of legal and technical due diligence. As part of the technical due diligence process, consultants contracted by Andina have completed flow tests on the wells. Preliminary analysis of the test results suggests that the permitted flow rates are achievable. A final report is expected during the second quarter 2008. A twenty kilogram sample of native sulphur mineralization, collected from an occurrence located on the slopes of Cerro Azufre (Sulphur Mountain) on the Volcan Gold Property, has been shipped to Advanced Mineral Technology Laboratory, Ontario, Canada, for the purpose of investigative metallurgical testing. The testing will determine the quality of the sulphur and whether it is amenable to flotation. As noted in Andina's technical report, "Review of Gold and Copper Exploration Potential of Minerals Properties in Chile" dated November 12, 2004, a reserve estimate of 4.7 million grading 40% sulphur was published by the Chilean government organization Centro de Investigaciones Metalurgicas y Mineras of Santiago in the "Boletin Minero" based on a Corporacion de Fomento de la Produccion report dated 1987. The reserve estimate is a historical estimate for National Instrument 43-101 reporting purposes, but is not a reserve as defined by CIM categories. Andina has no reason to believe that this historical reserve estimate is not reliable. There are no more recent reserve or resource estimates available to Andina. Under National Instrument 43-101 ("NI 43-101") of the Canadian Securities Administrators, the independent qualified person for the Volcan Gold Project is Ralph Gonzalez, a resident of Burnaby, British Columbia, Canada. Mr. Gonzalez is a professional engineer registered with the Association of Professional Engineers of the Province of Manitoba since 1977 and a Professional Geologist registered with the Association of Professional Engineers and Geoscientists in the Province of British Columbia since 1992. The recently released October 2007 Volcan resource estimate was prepared by NCL Ingenieria y Construccion S.A., Santiago, Chile in conjunction with Eduardo Magri, Ph.D. in mining engineering (Witwatersrand) and a Fellow of the SAIMM with over 30 years of industry experience. A NI43-101 compliant technical report related to the October 2007 resource estimate prepared by Mr. Gonzalez is filed with SEDAR and can be found at www.sedar.com. Reverse circulation ("RC") chips and diamond drill core from Andina's Volcan drilling campaign are collected at the drill under the direct supervision of Andina staff. Both the RC samples and drill core are appropriately tagged, secured and transported to the Andina exploration camp and then to Andina's secure sample logging and preparation site in Copiapo, Chile. RC chip samples are split to obtain a 15 kilogram sample for assay purposes. Representative chips are collected from each sample for logging purposes. Drill core is logged, marked at two metre intervals for sampling and split longitudinally with a diamond drill saw. One half of the core is bagged and sample tags attached and the second half of the core is returned to the core boxes. All samples were appropriately tagged and securely stored prior to shipping to Asesoria Minera Geoanalitica Ltda. 's ("Geoanalitica") laboratory in La Serena, Chile. Samples are processed and analyzed for gold using fire assay techniques using two assay/ton samples (about 50 gram) with an atomic absorption spectrographic finish for a sensitivity of 5 ppb (.005 ppm) gold with atomic absorption finish. Samples which return gold values greater than 1.00 g/t Au are re-analyzed by Geoanalitica using fire assay techniques with a gravimetric finish. Duplicate samples are inserted at a rate of approximately 5%. Approximately 15% of the samples submitted to Geoanalitica comprise standard, blanks and duplicated samples ensure laboratory quality control procedures. This release contains forward-looking statements, including predictions, projections and forecasts. Forward-looking statements include, but are not limited to, statements with respect to results of due diligence, conclusion of legal documentation, exploration results, the success of exploration activities generally, permitting time lines, mine development prospects, government regulation of exploration and mining operations, timing of scoping-level studies, future share issuances, and title disputes or claims. Often, but not always, forward-looking statements can be identified by the use of words such as "plans", "planning", "expects" or "does not expect", "continues", "scheduled", "estimates", "forecasts", "intends", "potential", "anticipates", "does not anticipate", or "belief", or describes a "goal", or variation of such words and phrases or state that certain actions, events or results "may", "could", "would", "might" or "will" be taken, occur or be achieved. Forward-looking statements involve known and unknown risks, future events, conditions, uncertainties and other factors which may cause the actual results, performance or achievements to be materially different from any future results, prediction, projection, forecast, performance or achievements expressed or implied by the forward-looking statements. Such factors include, among others, the results of due diligence activities, the interpretation and actual results of current exploration activities; changes in project parameters as plans continue to be refined; future prices of gold; possible variations in grade or recovery rates; failure of equipment or processes to operate as anticipated; labour disputes and other risks of the mining industry; delays in obtaining governmental approvals or financing or in the completion of exploration, as well as those factors disclosed in Andina's publicly filed documents. Although Andina has attempted to identify important factors that could cause actual actions, events or results to differ materially from those described in forward-looking statements, there may be other factors that cause actions, events or results not to be as anticipated, estimated or intended. There can be no assurance that forward-looking statements will prove to be accurate, as actual results and future events could differ materially from those anticipated in such statements. Accordingly, readers should not place undue reliance on forward-looking statements.